Embroidery needles - which ones do you need for what job? The following tips should help you pick the best tool for the job. These are medium sized, with a sharp point and a long eye. They come in sizes 3-10. The long eye allows more than one strand of embroidery floss to be threaded at the same time. 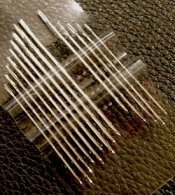 These are ideal for nearly all surface embroidery and smocking. These are a general purpose hand sewing needle. They have a round eye, a sharp point (as the name suggests) and are of medium length. They come in sizes 3-12. A short, blunt tipped needle, the tapestry is used for needlepoint, hardanger, blackwork or cross stitch on evenweave fabrics. They have a long eye designed to take thick or multiple strands of floss or wool. They come in sizes 18-28 and can be gold or platinum plated. 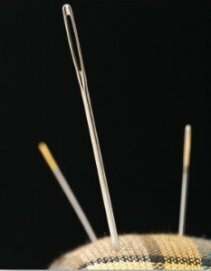 A thick, strong needle with a elongated eye for thick fibres and and a sharp point for coarse fabrics. They generally come in sizes 18-24. These are distinctive by the fact that the long shaft is the same width throughout until it tapers at the sharp point. They have a small, round eye which does not bulge outside the shaft. They are mainly used for bullion knots or Brazilian embroidery stitches where the thread is wrapped around the shaft. They come in sizes 3-10. These very long, very thin needles have a very small, long eye and a sharp point. They are fine enough to go through the hole in a seed bead and long enough for many beads to be threaded onto them. They are not strong and can bend easily. They come in sizes 10-15. These are short, round eyed and have a sharp point. They are used by quilters for quick, even stitching. They come in sizes 3-10. Made with a special eye, which is actually a slot, which the thread is pulled into they are used for the same general purpose sewing as the sharps. Whichever type you use it is important that they are straight and have undamaged tips. Stitching with a corroded needle will make life difficult as will using one that has burrs or pits in it. They should slide effortlessly through the fabric, not pull at it or tear it. It is a false economy to continue using a needle that has seen better days. You can keep your embroidery needles in their original packet or in a specially made needlebook. The traditional strawberry shaped emery is ideal for keeping the points sharp.